While most NYC weddings happen during the summer months, the latest exciting trend in weddings right now is autumn weddings. Many couples have been able to avoid some of the more uncomfortable aspects by moving the date back a few months later. The fall season is a truly magical time of the year and is an excellent time to get hitched. Want to know the pros and benefits of an autumn wedding? 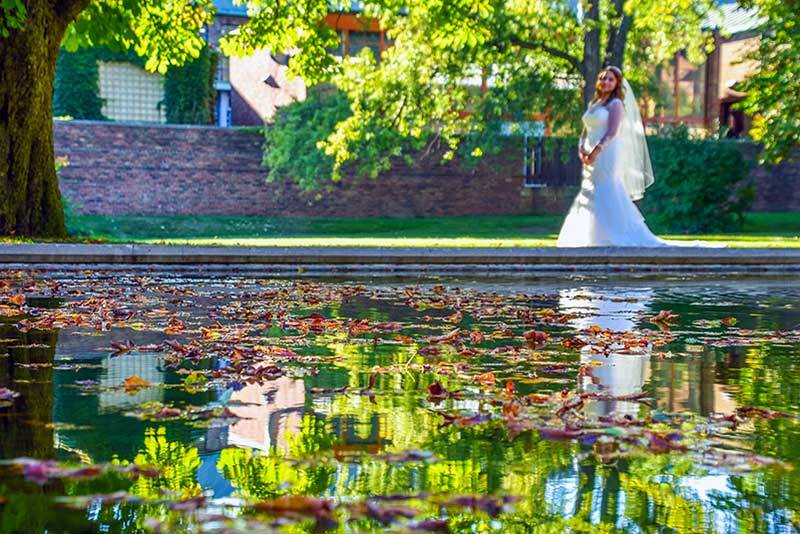 If you are weighing the advantages of a late year wedding here are eight reasons why autumn is the best season to get married. Color: Fall is the time of year when the trees set the color tone. Every natural shade is represented and begs for attention. From golden yellows to vibrant reds, bold colors can add spectacular effects to any wedding scene. Weather: With the heat of summer long gone, you cannot beat an outdoor wedding (provided it doesn’t rain, or it isn’t unseasonably cold). With mild temperatures, it is much easier to celebrate long into the evening. Cost: Planning your wedding after the traditional season often means lower prices. Many wedding planners and vendors cut their rates to attract business during the “off-season,” so if you are planning a wedding on a budget, take advantage of this time. Harvest: Autumn is harvest time, so many of your favorite foods are fresh and plentiful. From warm cider to apple pie, harvest season is the time to eat. Fall is full of food and family traditions, so infuse this feeling into your wedding. Long Dresses: The hottest trend in wedding dresses this season is long dresses and long sleeves. That’s right, classic chic and long sleeve dresses are back in style, in a big way. There’s no better time than the fall to take advantage of this hot fashion trend. Attendance: With everyone home from summer vacation, it is much easier to fill the hall with friends and family. Just make sure you schedule your wedding during a convenient time, either on the weekend or make it a night wedding. Better Conditions: Less humidity and heat means fewer problems with hair and makeup. There’s nothing more frustrating to be picture perfect and have the heat mess up your hair and makeup. During the cooler months, your hair is less frizzy, and your makeup is less likely to run. More Romantic: Many couples find that all of these reasons and much more just adds to the romance that can happen during the fall. The fall comes with a sense of stillness and passion, and many find this season to have an ethereal feel to it. If that’s what you are going for, an autumn wedding may just be for you! If you’re looking for a 2019 fall venue, now’s the time to get started on your search. Consider booking a beautiful private yacht for both your wedding ceremony and reception. We’re currently booking fall 2019 weddings aboard the Aqua Azul. Contact us for a free quote.